If you are looking for a primary school internship, your cover letter and resume is an essential part of your application. Your role is particularly difficult because of how closely you work with students. 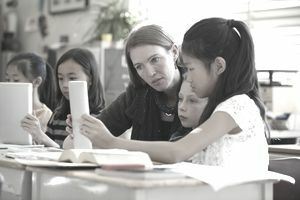 Succeeding in education requires a unique skill set which includes, most importantly, the ability to connect with children. Your cover letter is an opportunity to showcase your knowledge and passion for teaching while highlighting how you can contribute to the school. Your primary school internship cover letter should include a review of your academic career, including key courses, your GPA, and any awards or clubs you joined. If you have other work experiences related to education, such as working as a daycare aide or Sunday school teacher, those are excellent positions to include as well. If you are a regular volunteer with a nonprofit, particularly if it includes interactions with children, that is also beneficial to mention. Try to be specific in your cover letter. Instead of listing your key tasks, focus on results when possible, such as tutoring a child who previously failed the core curriculum and later passed with your help. This gives the hiring manager concrete examples of your abilities and reflects well on your professionalism. Don't be afraid to express your knowledge and interest in the role. Hiring managers want someone eager and informed when looking for an intern. This is an example of a cover letter for an elementary education internship. Download the internship cover letter template (compatible with Google Docs and Word Online) or see below for more examples. It is with great anticipation that I am applying for the position of elementary teacher’s assistant currently posted on Southbay’s website. My education and experience make me an excellent candidate for this position and my dream of becoming a third-grade teacher makes me extremely excited about the opportunity to learn more and gain additional experience by participating in the district’s new summer learning program. My first classroom teaching experience was as a teacher’s assistant for May’s Charter School in New York. I spent most of my time that summer preparing innovative lesson plans for students participating in the accelerated math program. I worked directly with students and student groups to ensure their understanding of the advanced concepts being taught. I thoroughly enjoyed this experience and felt that my creativity and ability to work with children was reinforced by the positive feedback I received from students, parents, and the classroom teacher. Last year, during my fall semester, I worked with upper-level fifth-grade students teaching advanced math and science. This was an exceptionally smart group that included special education students who lacked basic verbal and communication skills but who understood and grasped advanced math and science concepts quite easily. This experience taught me the importance of recognizing and managing the wide range of abilities that occur in the classroom. Although these students were taking part in an advanced class, they possessed a wide range of abilities and levels of understanding. Thank you for your time and consideration. I will contact you in one week to discuss my candidacy.